Occupation: newspapaer reporter in "The Daily Star"
Powers/Abilities: Super strong and nearly invulnerable. Wears a heat-resistant costume, and a cape which grants flight capabilities. History: Gabriel is the son of a scientist who gave his boy a formula which made him super strong and nearly-invulnerable. He also fashioned a heat-resistant costume for Gabriel, complete with a cape that enabled him to fly. Thus Kapitan Aksiyon was born. At first the scientist wanted fame and fortune, but upon seeing the good that his son could do with his powers, he decided to keep his formula a secret. Knowing it worked was enough for him. Comments: Created by Rod Santiago. 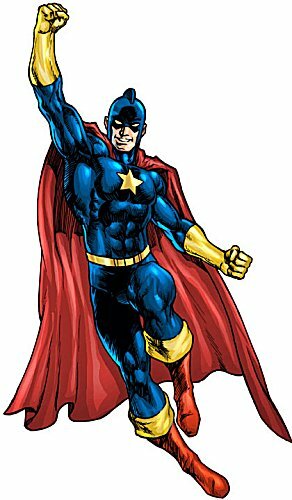 The comics character first appeared in the television screen on an episode of "Komiks" (Komiks, 2006), a television show featuring Filipino comics stories. Alfred Vargas was the first actor to play the role. Thanks to Jess Fernandez for the image to the right of Vargas in the costume. The image on the left of page is from Reno Maniquis' excellent Capsule Zone site, and is his excellent interpretation of this character. Image used with his permission. He also sent me the detailed history and other details used above, which Jess Fernandez later expanded on. 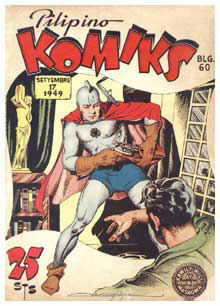 Jess also sent me the image of the Pilipino Komiks cover used on this page.